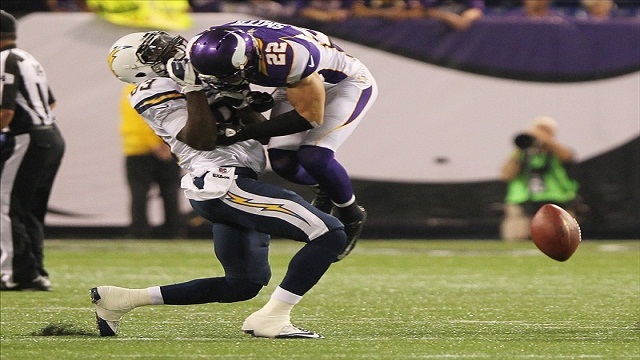 The 4-1 Vikings are preparing for an important road test against a frisky Washington Redskins squad. No, seriously, the 4-1 Vikings. NFC North Division leader Vikings. This is an important game, to be sure. The birdcage liners around the Twin Cities have been scouring game film from the past few games to find elements of the Vikings offense, defense, and special teams that need to improve. But, here is the thing, the Vikings are 4-1. Leaders of the NFC North Division. We, as fans, should be thrilled to be here. And I mean like Honey BooBoo staring down a Baconater with side of cheese curds thrilled. Coming in to this season, expectations for this particular Vikings squad were low, to say the least. Most mic jockeys had the team finishing around 3-13. Only Minnesota Viking employee and resident rube, PA, had this squad with a winning record through the first eight games. But here we sit. 4-1. That includes quality wins against the royalty of the NFC, the 49ers, and a playoff team from last year, the Detroit Lions. In fact, if not for a dramatic loss against the NFC North Killer Colts, the Vikings would be undefeated going into this week’s tilt against the Skins. Vikings fans should step back and enjoy the ride. We are playing with house money right now. Cross the middle at your peril with the Golden Fundamental roaming. Now, don’t get me wrong, could there be improvements? Sure. The Vikings have yet to face a premiere signal caller (sorry Fat Stafford and Andrew Horseshoe Up My Rear). The Vikings secondary still seems to lack the ball-hawking skills of a great defense. Though, the addition of the Golden Fundamental, save for last week’s Earl Weaver blow-up, has certainly steadied what was a very inconsistent unit. They still have a long way to go in terms of keeping up the Jones, aka da Bears, who have housed four defensive TDs in the last two weeks. And I suppose, I cannot call you Busey for saying that the Vikings offense has been maddeningly inconsistent. They had four scoring drives of more than 60 yards against the Titans and 49ers but only two, one, and zero against Fat Stafford, Blaine “No I Am Not The Lead Singer Of Death Cab” Gabbert” and Senor Horseshoe Up My Rear, respectively. Without sustainable, and better yet, repeatable offensive game-planning, this team may suffer some defeats. But again, 4-1 people. 4-1! I would have been thrilled with 2-3. Furthermore, considering the gut-breaking and heart-wrenching losses Vikings fans have endured over the years, stuff it Lord Favre, a 4-1 start when the doom and gloomers were predicting far worse is winning all day. And yes, I am talking Chaz Sheen at the peak of his Busey, winning. So come on in! There is plenty of room and the water is pretty damn warm. Skol Vikings. This entry was posted in Home, Vikes v. Pack and tagged 2012 Vikings, Andrew Luck NFC North, Harrison Smith, Matt Stafford, Minnesota Vikings, NFC North, Paul Allen VOX, Percy Harvin, Vikings bandwagon, Vikings early season success, Vikings record, Vikings Redskins, Vikings Redskins preview. Bookmark the permalink.